I am not sure why my invoice reflects these amounts. An overview of your daily invoice charges. 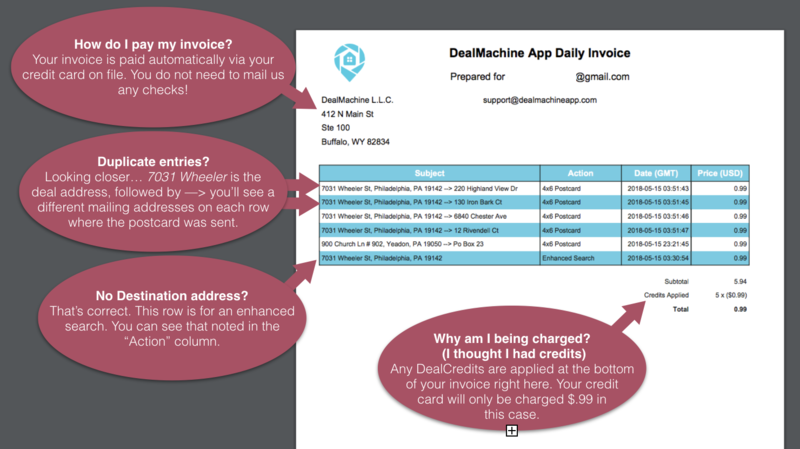 DealMachine will send you an invoice at the end of each day. All charges are broken down in detail so you can see them. The Daily Invoice reflects usage that occurred in the last 24 hours, which includes any repeat mail that was sent out in the last day. In this invoice, 7031 Wheeler Street is listed 5 times. The first 4 rows represent postcards that were sent to 4 different mailing addresses. You can add/edit/remove mailing addresses for a deal in the app. The fifth time 7031 Wheeler Street is mentioned on this invoice is a charge for using the enhanced search function to get the owner's phone number, emails, and mailing addresses. If your credit card expires, you can update it in your app like this.